The Aileach squad pictured after winning their first ever Ulster Junior Cup. 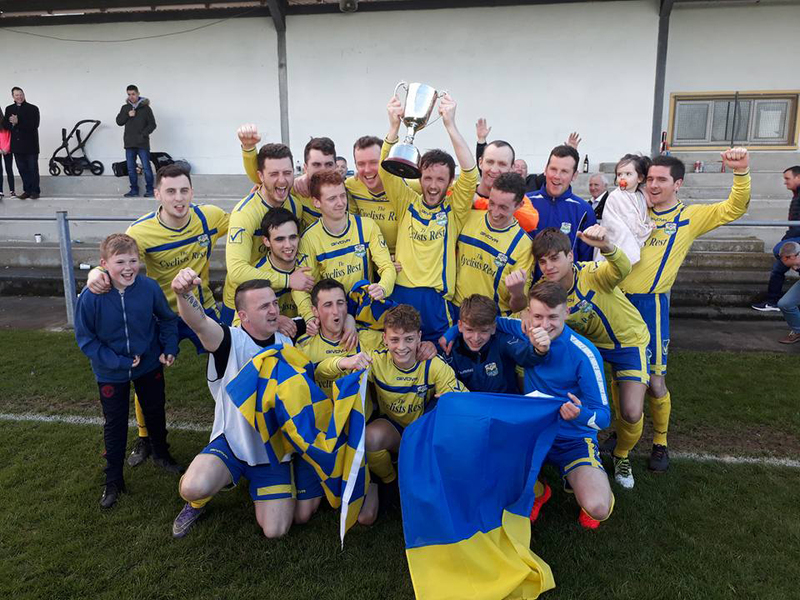 WITH no league games this weekend in either the Premier Division or the First Division, it’s all about the Ulster Junior Cup and the Ulster Junior Shield for Inishowen League teams. John D O’Kane’s Carn will look to put their poor league form behind them when they travel to take on Bonagee Utd. Carn have the ability to get a result here but on current form, it’s a Bonagee win for us. Aidan Doherty’s Illies are on the road again when they travel to Kilmacrennan of the Donegal League. This is a tough one for Doherty’s men and we can see a Kilmacrennan win. in the league at the weekend when they travel to take on Lifford Celtic. If they travel with a ful squad, we can see a Clonmany win in this one. Shane Byrne’s Glengad will be keen to back up last weekend’s 3-0 win over Castlefin when they hit the road and travel to take on Cappry Rovers of the Donegal League. It’s hard to see anything other than a Glengad win from this game. Inishowen League leaders Aileach are another team on the road and they will be in Convoy on Sunday as they look to retain the trophy they won for the first time last season. Despite the fact that they are top of the table, Aileach have been hit and miss so far but it’s an Aileach win for us here. The only all Inishowen clash this weekend sees Stephen McNutt’s Buncrana Hearts take on Derek Doherty’s Culdaff at Castle Park. Culdaff are just off the back of an impressive win over Carn in the league, while the Hearts had no game last weekend. This could be a tight one but with home advantage, it’s a Hearts win for us. Cathal Faulkner’s Redcastle have been given a home draw against Donegal League side Cranford Utd and given that they have shown signs of improvement in recent weeks, we are going for a Redcastle win. Don’t miss Tuesday’s Inishowen Independent for full coverage.